I got a good deal on a used body. Of course now I am kicking myself because Canon is selling Refurbished 5DmkII’s for under $1800 at the moment (new going price is $2199 today on B&H). This HAD to happen a few days after I got a really good offer and bought a used one… Oh well. My point is if you are patient you can find a good deal. The 5D and 7D are both super tough cameras and I feel very safe buying used because of that. I could be wrong but I really don’t think the price of new 5DmkII’s will be going down anytime soon. If you read the comments from this post a lot of people are excited about the 5D3 only because they think the 5D2 will go down in price… The 5D2 still holds a lot of value, so I don’t think we will be seeing a price drop because the demand isn’t going away. I’ve been shooting with the 7D for 2.5 years and have loved it. Still has a lot over the 5D. BUT da-mn that full frame sensor image is incredible. I’ve shot with the 5D before but owning one and using it with all my lenses has been soooo much fun. And still having an APS-C now gives me double the lens use. The pro level DSLR bodies seem to hold a lot of value over the years. So I think I will get a decent amount when I sell of my camera bodies to upgrade down the road. Lets not forget why we be buy gear in the first place… I’ve said before a lot of what I do involves interviews and a lot of the time these interviews are in tight areas. That larger sensor is going to be so nice in an A/B camera setup. She outa tag team nicely with the 7D. So bye bye Sony 5n. Its been real. 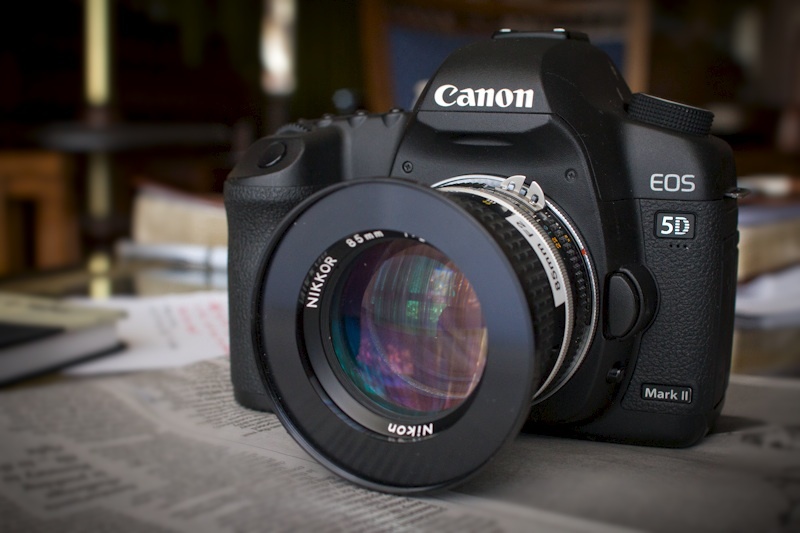 If you can afford the 5D3 then go for it (good write up here on that subject). I don’t think it’s a wise move in my situation. A 5D2 is a fun cam and heck, it’s been good enough for some big gigs so I am happy. So what’s your take on the subject? You making any moves to/from a 5D? i did the exact same thing, dude. sending out my check to my dear friend in LA for mkii! I’d really like to upgrade from my 7D to a full frame, but I cannot justify the cost just yet. Maybe one day soon. And by that time, hopefully the 5D3 has come down a little. I have a 550D and it has more than paid for itself. Now I use MKIIs and I too awaited the MkIII launch to see what would happen with the MkII price. I however feel the refurbished MkII’s will not really shift in price as the MKIIIs are priced at just right for Canon to benefit from strong price integrity. Dude, my though exactly… went with 5D MKII body only as well. What compact flash do you guys recommend on the budget? I bought my 5dii last year as a refurb for 1799. I think it is a great deal. I shoot weddings primarly and have to think if getting 2 stops of light and little moire is worth 1700 bucks to me. The 30 minute recording time isnt a big deal because I run ML. The head phone jack isnt a big deal because we always record with multiple sources. I will need anothee body in May. Still undecided. Doesn’t anyone find the 5d too shallow? I used to shoot mainly stills so I bought a couple of 5D mkII bodies almost 3 years ago that my wife and I use. I have these cameras to thank (to blame) for introducing me to the world of video production. Both bodies have been on many photo and video shoots over the years and have never failed me. I am still in awe of their ability in low light. I understand the criticism of their focusing mechanism but I always leave my cameras locked on the single center spot and it has never cost me the shot and it’s irrelevant in video production. 4fps is enough for me (I don’t often shoot sports or wildlife). I’m sure the better, less compressed video files will be better but most of my output ends up on YouTube and embedded in corporate sites where people watch it on their iPhone or laptop and very rarely at 1080p so my clients aren’t likely to notice. I use the original Zoom H4 with the line out into the camera and its dedicated headphone for monitoring so I’ve had headphone monitoring already for years on my mkII. I do envy the longer shooting clips of the mkIII but I’m usually shooting interview with 2 mkII bodies so I just have to make sure I go through stop/start cycles on each camera individually every 9 mins or so to avoid any breaks in footage. Are you selling off your little buddy the 5n? I was about to order a Panasonic GH2 but it’s practically invisible on DSLR videography blogs. Seems like the only cameras mentioned are Canons. Am I making a mistake buying the GH2? I really like the crispness and smoothness (when hacked) of the videos it produces. I would have taken a loan, used checking overdraft, put the additional $1,500 on my credit card — done whatever necessary to get the Mk III. If you are a professional, why invest in old technology, even if you think it will cover most of your shooting environments? I guarantee there will be many instances where you will say to yourself, “I wish I had the 5D3” due to its better sensor (the MK II sensor is 8 years old) and improved image quality and subsequent decreased jello/moire/aliasing, its headphone jack and audio controls, its 720 HD out, its 61 point AF system etc etc. Good Spring for work here in Portland (Maine). Taking some of that money and turning it into a iii. I double video and photography, so find the combination irrisistable. Also, a company I work with said they would rent from me if I picked one up. Work and camera, that can help pay for the camera that I work with. :) Been waiting for the fullrame, leapfrogging from the 60D. Have to admit, a bonus is all the attention that it attracts. Wish talent was all that counted. 2200€ is an awful lot for a second hand relatively low resolution camera with massive moire and aliasing problems. I eagerly waited for the MkIII but I’m one of those wierdos who likes being in the APS-C Zone. My 7D has been a trooper for over a year and done all I’ve asked of it gloriously. When the new 5D came in over my budget and missing a few video features I was hoping for, I looked elsewhere and found a NEX-7. It’s everything my 7D is plus more, for less money.